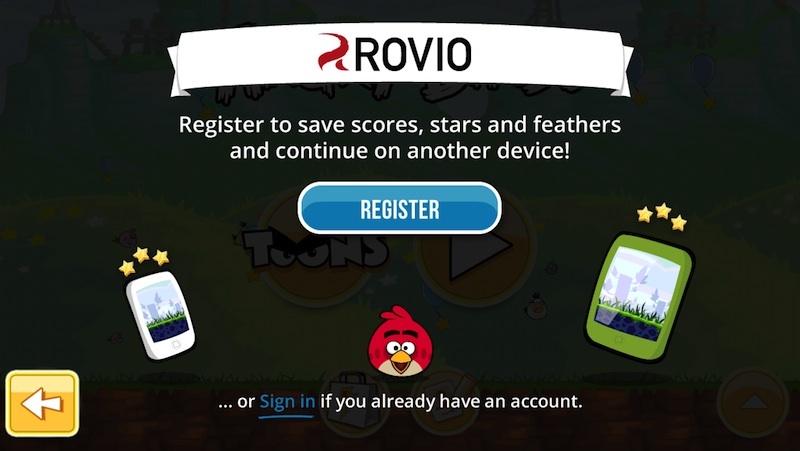 Back in May, Rovio announced a new "Rovio Account" feature that would allow users to sync their progress on games such as Angry Birds across devices. At the time, the feature launched with limited availability, arriving worldwide for The Croods and only in Finland and Poland on the original Angry Birds game. Rovio today announced that the new Accounts feature is now available worldwide on the original Angry Birds across iOS and Android devices, although it is yet to come to the other games in the Angry Birds family. We know that you've all been waiting for a way to sync progress between devices and we really feel that we have an amazing solution in place now. For now, Rovio Account is available on the original Angry Birds game, as well as The Croods. The next step is for us to roll this out onto other Angry Birds and non Angry Birds titles, so that's exactly what we're going to do! Angry Birds for iPhone [Direct Link] and iPad [Direct Link] are available in the App Store. Serious question: Why can't this use Game Center or iCloud? They don't work on Android. Is the focus on iOS and Android. All devices should also include Macs, right? I don't mean that Android doesn't matter, but that adding iCloud support doesn't take away one whit from a cross-platform Rovio account. Not entirely unlike how 1Password supports syncing through iTunes, iCloud, Dropbox, or via WiFi. It's the same save file being synced. Personally, I'd much rather use iCloud, as I don't have to set up yet another account. And, it'd in fact, just work. And I would still be glad they have the Rovio account as an option, so that others could use it that need it, and for it to be an option for me in the future if I started using other platforms. My question is, will it sync between the iPad and iPhone versions. Since Rovio LOVES reselling their games with the "HD" tag on iPad at a higher price, they are technically separate apps. We need way more of this. Helps with those that want to jump ship on an OS. I only see consumer benefit here. How many people switch off playing a game between iOS and Android versions? I do. I play on my iPad at home, then at work or on the road, play on my Galaxy S4. Or visa versa. I just want a way to backup my progress in case of a system restore. They should still offer an iCloud feature. This needed to be added years ago when I actually still played angry birds.